New Winter 2018: Commemorate this special year for your son or offer warm wishes to friends with a boy baby Christmas ornament that looks like grandmother knitted it. 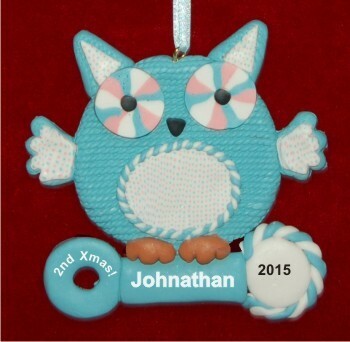 The baby boy’s second Christmas personalized ornament is just adorable with its cheerful owl in handsome baby blue. It is one of our large collection of baby first Christmas ornaments and second-year ornaments that offer your favorite styles and colors for creating a collection. One of our lettering artists will make the blue owl second Christmas ornament a lasting treasure by adding the little fellow’s details in a handwritten font.